Help support Kate in her fight against leukemia! Many of you are aware that Kate Jauch is battling a relapse of Acute Lymphocytic Leukemia. 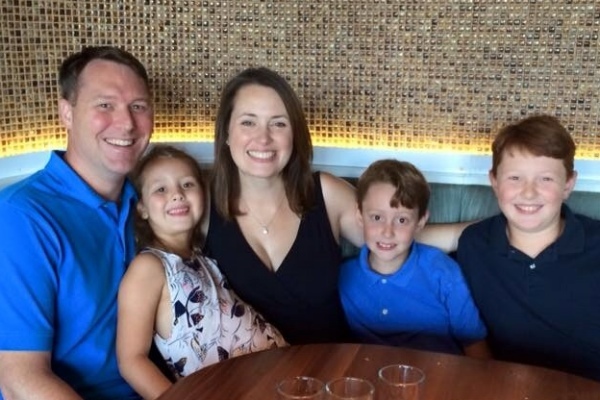 If you know Kate, you know that she not only is an incredible wife and mother of three children, but also a vibrant, loving, and resilient woman who is well-loved by her family and friends. Kate was first diagnosed with leukemia in 2010. She braved rigorous treatment with chemotherapy followed by bone marrow transplant, and had been cancer-free for almost five years. Unfortunately, this September she had a relapse of leukemia, shortly after she and her family moved to Poolesville, MD. She currently is undergoing treatment with the hope of receiving a second bone marrow transplant. The last several months have been very difficult for Kate, her husband Scott, and her children—Andrew (10), Will (8), and Greta (7). The emotional and physical challenges of facing leukemia cannot be overstated. The support of family, friends, neighbors, co-workers, and the community has been invaluable to the Jauch’s. Kate finds great hope in knowing that she and her family are being cared for and cheered on. The cost of a bone marrow transplant is very expensive, even for patients with medical insurance. This can include transportation and housing costs, medications, home services, and out-of-pocket hospital and outpatient charges. To help with the financial burden of Kate’s uninsured expenses, a fundraising campaign in her honor has been established with HelpHOPELive, a trusted nonprofit organization that has been providing community-based fundraising guidance to patients and their families for more than 30 years. All donations are tax deductible, are held by HelpHOPELive in the Mid-Atlantic Bone Marrow Transplant Fund, and are administered by HelpHOPELive for transplant-related expenses only. Please consider a contribution. You can make a credit card contribution on this site, or call 800.642.8399. Contributions made by check can be sent to the address listed to the right. You are in the thoughts and prayers of many people. Be strong! Dear Kate, You don't know me but you dad helped guide Laraine and me for many years through building and financial challenges facing the Burnt Hills and Shenedehowa School Districts while your mom was so helpful in teaching us to manage an active sheltie with a mind of her own. Best wishes for a full and speedy recovery. Kate We have never met but working in education for 32 years, the efforts of your husband constantly inspired me. In some manner, I wanted to be able to reach out to you and support you and your family through a very difficult time. There are many people sending you their good thoughts and best wishes.